And it'll soon be taking the fight straight to the BMW 4 Series. Lexus has been on a quest to rebrand itself for a few years now, and today we’re able to see the fruit of its labor with the online debut of the RC Coupe. Set to have its live debut later this month at the Tokyo Motor Show, the RC Coupe is the two-door variant of the IS sedan. 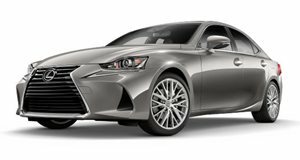 Two different versions of the new coupe will be shown at Tokyo, the RC 350 with a 3.5-liter V6, and the RC 300h hybrid, which has a 2.5-liter engine paired with an electric motor. Additional powertrain details will be announced at a later date. There’s no doubt the design of the RC Coupe is quite striking, notably with its contoured profile and the low-set spindle grille. The front headlights, inspired by those on the 2012 LF-LC concept, feature three LED lamps. Two different aluminum wheel designs are also offered, a sculpted 10-spoke 19-inch wheel or a muscular five-spike 18-inch version. The interior layout appears to be nearly identical to that of the sedan. Covered in wood trim and featuring a seven-inch navigation screen, Lexus describes this space as a driver’s cockpit. The seats are molded using foam, a process that’s similar to what’s used for racing seats. Full details will come soon, but the new BMW 4 Series may have met its rival.